This is my vegan version of a Yoruba classic: efo riro. This rich spinach stew is great with rice, pounded yam, eba and other starches. I like to make a large batch of this and keep in the fridge to last me the week. Blend the peppers, tomatoes and onion in a food processor to form a smooth mixture. Heat the oil in a pot and add the pepper mixture, disolve the stock cubes into the sauce and bring to a boil. 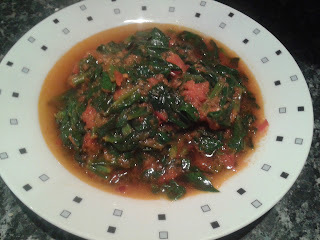 Add the chopped spinach and iru (fermented locust beans) after 10 minutes then turn the heat down. Season with salt. Simmer for 30 minutes and you're good to go. do you have to add the iru? You can skip out on it, but it does add a great flavour to the finished dish. Where can I find iru? Where can I buy the iru at?